I’m puttering around the campsite when I see them. That's Al and Kelly's motorhome on the hill. There’s a herd of horses on top of the small hill next to Al and Kelly’s campsite. Gradually they graze their way down toward us. Spike gets himself all in a dither, barking, so I pick him up, and sit in the camp chair with him in my lap. Now the horses are becoming curious. They come closer until they’re about twenty feet from the patio mat. Oh-my-gosh! I count ten, beautiful, equine faces, no two the same color, side-by-side in a semi-circle, and each one is looking at us! I’ve got my camera up, I’m poised to click, and . . . what’s this? Oh, NO, low battery! Right at the moment ten horses stand in a perfect pose, I’ve got a useless camera. Darn! I run inside and hook the camera up to the inverter for a charge.
. . . and away they go! Every horse is a different color. Spike’s resumed barking like a maniac. I see out the window that the horses are moving on. I grab the camera again. Maybe there’s enough of a charge for at least one photo, maybe two! Following the horses is a herd of cattle. Cattle are fine, but I'd rather see horses. Sitting at my little table at the back of the BLT, I read blog comments on my laptop. The day is sunny, warm and calm so I’ve got the door open. All of a sudden a bird flies in! He flutters around and lands on the top of the closet door. After getting a good look, out he goes. Of course, I do a search and the best I can tell – I was too surprised to note his markings, just saw he was gray – he’s a Say’s phoebe. That tiny, pointy bill indicates he’s an insect-eater. The window blind is up so I can glance at the bird feeder over the laptop screen. The only visitor so far is the male house finch. He stops in several times throughout the morning. Boy, he must feel like he hit the mother lode! I go back to my laptop to reply to comments, and wouldn’t ya’ know, about ten minutes later, in comes that gray bird again! Oh-my-gosh! He perches on the closet door for a moment, looks around, and flies out. The crew waits for walk-time. I’ve shown my Casita to a lot of visitors, but this is the first time I’ve given the tour to a bird. 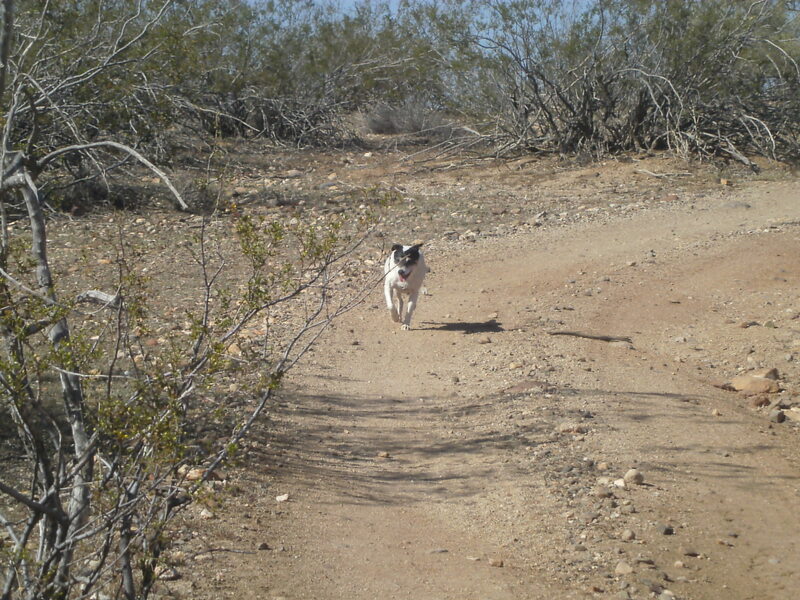 Spike, Bridget and I make the short trip up the road to the Escapees’ North Ranch. I’ve got my tote bag carrying fresh clothes and bath supplies. I turn the PTV into the Ranch’s parking lot with great anticipation. Oh-my-gosh. I realize this will be my first hot-as-I-can-stand, long-as-I-want shower since last fall! I park the PTV far from the office, motorhomes, and park models because I know the crew will wail their lungs out while I’m inside the shower house. The shower stalls are large and sparkling clean. Oh boy. I actually take two showers. The first with a scrubber brush, the second with a washcloth. I wash my hair and give myself an exfoliating facial scrub treatment. I take my sweet time under that heavenly hot water pouring all over me. If all I get out of my annual membership dues of $70 are a few showers while boondocking in the desert, it’s worth it! My little Wal-Mart charcoal grill does an excellent job tonight! "C'mon, Spikey! Time for supper!" After rubbing the chicken breasts with canola oil and seasoning, I put them on the whitening coals. Unlike the last time I tried to grill chicken, these cook perfectly because they are skinless. The skin makes too many flare-ups and burns. Mmmm. The crew and I feast together next to the grill. Oh-my-gosh. This is so good! The outside of the chicken breast is golden brown with the juices seared inside. The white meat is tender and the slight char-taste makes it delicious! Oh. My. Gosh. This is good livin’ . . .
P.S. If you enjoy seeing a happy dog, click on Spike’s photo to enlarge it. He’s got oh-my-gosh pumping through his veins! This entry was posted in Simple living and tagged Arizona, boondocking, casita, charcoal grill, desert, Escapees, fulltiming, North Ranch. Bookmark the permalink. Hiya Sue … First comment. WOo HoO!!!! Wow, you are the luckest person alive, horses, cows right at your door step, I will take those any day over bears, coyotes, and wolves which we don’t lack here in northern ontario. wonderful pictures and such beautiful horses. And now your trailer has become a bird cage to, just awesome. That shower must have felt heavenly.. you are living the dream rvsue.. and we are grateful that we are part of your adventures. take care, and hi to the crew. Hello, bearwise! I hope you had a great day! How did you end up in northern Ontario, if you don’t mind me asking. Were you born there? Bears, coyotes, and wolves . . . Yikes! Hi, Kathryn! Always a treat to see your name pop up here . . .
Ranchers can lease this land to graze cattle and horses, even though it’s public, but I don’t know where the horses came from. 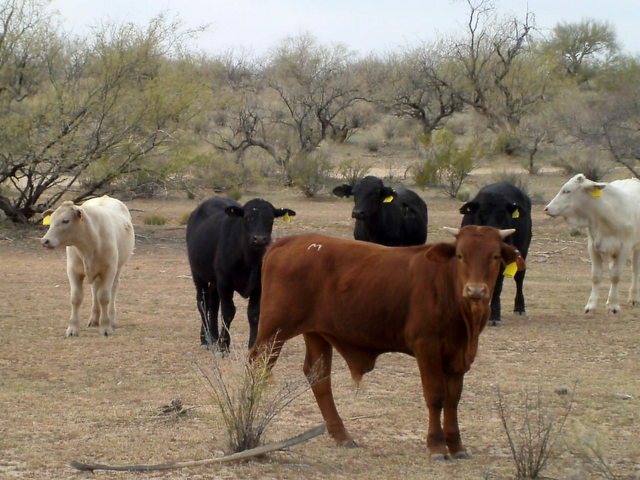 I could see the brand “66” on the cattle. Love hearing about your crew. We have 3 pups – Tuff (8 yr old rat terrier), Daisy (2 yr old Jack Russel/Pomerainian mix), & Gaby (8 months – Long haired chihuaua) all very spoiled. Each has a unique personality. Your Spike reminds me of my Tuff, extremely smart and very special. Daisy is the sweet and loving one – and a serious kiss’r. And Gaby is just an adorable spoiled kid sister to them – keeps them on their toes. We have 3 1/2 years before we go full time, so until then we live vicariously through the blogs, looking for sights to see and take our pups, and we have already decided boondocking is the way to go. Enjoy your travels. Oh my gosh, I love you, too! Your excitement over your day is infectious. It gave me pleasure to hear about your adventures. Just a comment about bias against those poor cows…horses poop too!!! And there’s almost nothing in the world better than a good hot shower, huh? You’re right, Donna. I’m not being fair to the cows. But there’s a reason they make calendars of nothing but horses. The cow calendars are usually cartoons. Sorry. What a treat …horses right at your campsite. How exciting! My Mom experienced the same thing in NM, until she realized someone was feeding them and they dropped their calling cards on HER space, which drew flies! She moved spots, but was able to catch some on her camera on their next visit thru the CPG. Enjoy Congress & Wickenburg. Prescott $ the road up from where you are. You’re right. I want photos, not poops. Thanks for joining in here . . .
What an exciting day !! They could be wild horses?? We have those all over in the hills of Nevada. I live in Ca. but very close to Nevada and go hiking there sometimes and see herds of wild horses. Sounds like a very friendly bird !! Just wanted to ask. What is the $70 membership dues you refered to?? Is it a campground club?? or just for that one campground? Have a lovely sunset !! Escapees is an RV club. They have RV parks for overnight and short stays, long-term leases, and deeded lots. The parks have a club house, activities, outings, and so forth. There are local chapters and get-togethers. Members can use the mail-forwarding service, travel insurance, roadside assistance, etc. There’s a newsletter and travel guide. I don’t know much about the organization firsthand, just what I’ve read in the materials sent with my membership and from their website: http://www.escapees.com I figured I’d give it a try as it’s an extremely popular club. The horses didn’t seem wild. But then, what do I know about how wild horses act . . .
escapees sounds like a good deal. I read about a couple other rv clubs that sound good on frugal-rv-travel.com . Hiya’ Sue!!!!! By the tail length, the horses look to be about 2-3 years but in too good of shape for BLM horses. 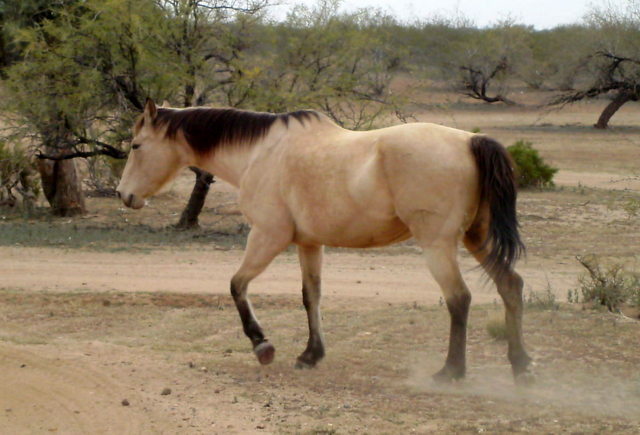 Ranchers will turn out horses of this age to get used to the cattle but the light colored one ( a buckskin)is gorgeous!!! Get carrots next time you’re in town and they’ll keep coming around and you’ll have some constant visitors. FYI, cow poop attracts more flies than horse kaka!!! Oh for heaven’s sake . . .I’ve got carrots. I didn’t think of giving them to the horses! One of the horses was very young, not full-grown, a beautiful roan color with white down his face. To see the grill go to the February 16 blog entry title “Desert Living.” There’s also a photo in a Jan. entry titled “Hiking the Sonoran with Canine Guides.” It cost $14 and folds up to the shape of an attache case. The carpet is 9′ x 12′ . . . I think. (It’s dark right now so I’m not going to go out and measure it.) I bought it through Amazon.com ($65). You can get them cheaper at Quartzsite but I don’t know if they’re the same quality. 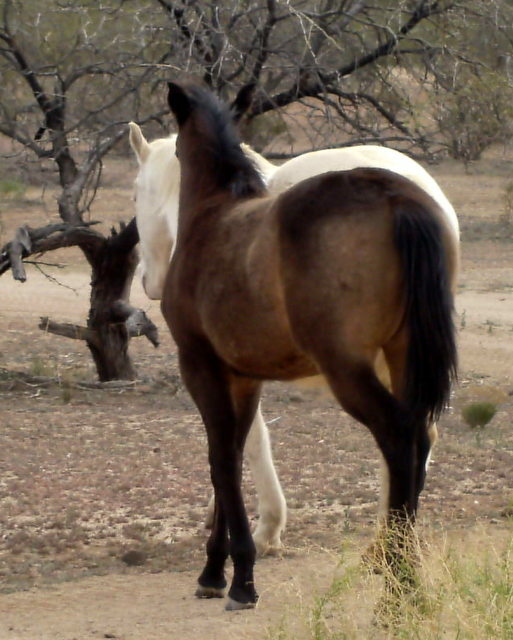 It was the buckskin that caught my eye too. I have never owned a horse but I certainly do admire them. Such beautiful animals. You certainly did have some oh-my-gosh moments today. Are you here, Donna? The way you say “the buckskin caught my eye, too!” I noticed a Class C pulled in nearby just before dark and you have a Class C, right? and price of water.. Some communities are having water trucked in and you buy it by the barrel. Enjoy all of that water now; it may not last!! That Woo-Hoo would be me in the shower! As far as using water . . . I deserve a medal for water conservation, including the shower. There are people who take showers EVERY DAY! I felt guilty for about one-half of a second. Trailer-trash that I am, I’ve got a screen door but I hardly ever use it, just let the doors hang wide-open. . . dogs running in and out . . . sheesh. Oh my gosh! Yes, it is! How jaw-dropping to see the horses, so close and….. with low batteries! I’d probably charge every night if possible. Instead I carry extras everywhere I and the camera go. Although I certainly identify with the all you want hot shower I dream of a bath. From now on I’m charging the camera every night! Oh. My. Gosh !!! Hahaha! I can’t tell you how many times I have been caught off guard ready to shoot the perfect photograph when DUH no battery power! Chuck teases me about it when it happens! Not so serious now that I am retired and shooting more scenery than anything, but when you are getting paid to shoot sports and the camera dies just before the winning touch down… that’s not so good! Glad you got off a few shots to share with us! The horses are beautiful !!! Hope they come back soon !!! Hugs to the crew! The one that got away, right? What a photo those ten curious horses would have made, all different colors .. . erghhh!!! Hugs to the herd! Those horses are beautiful! And that bit about the bird made me grin. I’m glad he didn’t leave any, uh, presents behind. My camera doesn’t work as well as it use to (there was an accident involving a giant hamster wheel) and it sometimes it says the batteries are fine when they’re actually not. I’ve lost good photo opportunities more than once because of that, I guess it’s time for a new camera. Like always, can’t wait until I get my chance to go boondocking out the desert. I love reading your posts because they remind me of what’s waiting. I’m finally getting my Casita though, going to pick it up this Thursday, so excited! Wow! This Thursday! Good for you! That is something to be excited about. I’m happy for you, Becky. Or you can skip the camera like I did and just pester people with questions wherever you go! Hi Sue – I sure do enjoy reading your blog. Hope to be in the same area next year at this time. I will be traveling in a van conversion (class B) Just wondering if you see any around in the areas where you have been camping. I am trying to figure out how I would save my camping spot when going to town or sight seeing. If you ever see a van will you let me know? Yes, I’ll try to remember to write about it on my blog. I was wondering if you could have a sign made that would be on a simple A-frame. You could put it in your camping spot when you leave . . . something cute and friendly …. but making the request that the site not be taken. And/or carry some cheap, $6 camp chairs that you would dare to risk losing, and set them up in your spot to leave behind while you’re away. I saw a 2007 Casita Freedom Delux 17′ for sale on line about 1 1/2 hours from me. I emailed the dealership and the sent me an email bak saying the cost is $3995 make an offer. The price seems low to me for what it is but I thought I may go look at it later in the week if I get a chance. I believe I could tow it with my van. WOW, that is way cheap for a 2007 and the deluxe. Either mini equipped or something wrong. Should be about 8-10 thousand! It won’t last long at that price if 1/2 decent! I thought it sounded awful cheep. I am not very handy and I figure if they are easy fixes the rv dealership would fix them and sell for a much higher price. Hi Sue, I was so excited so see that you had blogged. The horses are just beautiful! What a lucky lady to have seen them. So glad you were able to get some pictures. Yes, you can go join in the Escapees activities and seminars, use the facilities, and go to their get-togethers. Having a site is not required, only membership. There are Escapee parks all across the country. You also get 15% discount at thousands of RV parks. Good deals on motorhomes and trailers go quickly. Good luck finding the one that’s right for you at the right price! What a great desert day you had! Beautiful pictures and, once again, a well-told story of a day in the life of RV Sue and the canine crew. Hope today offers up some lovely moments. The picture of Spikey running for supper made me laugh. Glad you enjoyed Spike’s photo like I did. If you hovered your cursor over the photo, you know it was a fake. I couldn’t help but use it. He looks like he’s coming home for supper as fast as his legs will carry him! I Like your idear of adding one or two` folding chairs` to your campsite . Simple and cheap “safety“ insurance also while your camping. Plus as your blog is getting more popular your social life will bound to heat up and outdoor seating for your “invited“ friends seems like a good idea. A two-fur on any camping itemed is the only way to go. Thanks for sharing your Blog writing “talent“ with us fulltime dreamers like myself..
Give the famous Bridget and Spike high fives for their contributions also. When I brought home my brand-new camp chairs, I didn’t throw out my old one that I bought years ago for $5 on sale at a grocery store. The seat is falling apart but I still use it when I have company or I’m doing something that might make a mess. It’s the only chair I have that will fit in the aisle of the Casita. I sat in it in the aisle when Al, Kelly, and Gaelyn were here on that windy day recently. What would my blog be without “and her canine crew”! Bridget and Spike are an endless source of blog material. . . every day something new . . . Glad you enjoy reading this stuff. What a magical post! I sure wish we were there right now. It’s hard to believe it’s been a whole year since we were in the same spot. I can almost smell the air and see the dust puff up on the paths as you walk along. Hi, Karen and Steve . . .
Those “dust puffs” are around the horse’s hooves in the photo. It is nice here, isn’t it. What a find! A veritable Zoo! I love that. Two more weeks and we’re headed for Sedona… if we’re not snowed in. Good for you, Mark! I hope you have clear weather for the trip. I remember from living in NY state that this is the time of year when winter seems to d-r-aaaaaaaaggg on and on . .. dirty snow along the roadway . . . Somedays I used to wonder if Spring would ever come. Well I must say this new homestead has more excitement!! Love the pictures and the birdie flying in to check out your place. You make us feel like we are there with you. Awwwh a good hot shower What a Life! That is too bad about your camera battery. I had the same thing happen to me when I was down in Mexico last week. We were eating breakfast with the owner of the winery when she announced that one of her mare’s had just given birth about an hour before. We all went down to look at the new colt up close. I snapped a couple of pics and wouldn’t you know it my camera said “Battery exhausted”. That is the first time that has ever happened to me. What a bummer!! Fortunately several others got pics and I will ask them for a couple for my blog. It looks like you are really enjoying yourself out there. I stayed at North Congress last year for a short time and also enjoyed the long warm showers. Oh, Jim! Your experience with a dead battery is worse than mine . . . What an experience to miss capturing. I’m looking forward to see ing the pics of the foal on your blog. Jim travels in a LazyDaze Class C. His blog and photos are way more interesting than mine! You saw horses. They are beautiful. Now the burros. Hope we are out that way for an extended period of time next year. What beautiful pictures. We are camping in Bend at the moment. It is cold and snowing. At least we have full hook-ups! Tumalo State Park. Tumalo State Park in Oregon . .. looks like a lovely place. I googled it. Except I think I’d want to camp there any time except winter! You two are die-hard campers! I’m glad you’ve got hook-ups. Ain’t life GRAND?!! Your post made me smile from ear to ear…..enjoying your enjoyment! Thanks for being you Sue! Ah gee Sue, I thought today I was with you enjoying beautiful weather. Our temp today as been hovering in the low 80’s with 15% humidity – only thing wrong was the scenery! Wish I had that too. You be doing good gal, enjoying your posts. Boy Sue, what a following you have now!! I’ve read your blog since day one…commenting every now and then. Its wonderful to know that so many people care about you and how the RVing lifestyle is agreeing with you. I hope that when I become a full time Rver, the crowds will still be around. It warms my heart and reaffirms my faith in humankind.!! Keep up the good work, great posts and pics. I hope to catch up with you sometime..next time you’re in Tucson, maybe. Can’t imagine how good that shower must have felt after not having one since fall or at least a full-fledged one with unlimited hot water supply. Whew! You’ve got to have Pheebs give Spike a few tips on how to behave around cattle and horses. How cool to have wild horses come to visit! Get some carrots and apples and they will come often. I had no idea about membership, being totally new at this. When and how do I apply or pay before I head out in a couple of weeks? Or do I just pay as I go as I enter the areas? P.S. I was reading your previous blogs, catching up. I saw the air bed you had in the van, ‘in the beginning,’ and I saw the somewhat negative comment about it that followed by the gentleman. I’ve had my full size air mattress, Main Stay, for over 5 years now. It has nice padding and a thick mattress cover on it. They definitely do hold up – Contrary to popular belief! I enjoyed reading about the fun you are having…so wonderful…and I love the dogs. We spend time aboard ’27 ft boat and my husband put 13′ of living space in a car hauler for us. I don’t care what I am on..I just love to go.